A 6-year-old girl presented to the dermatology clinic for the evaluation of a diffuse, pruritic eruption of 3 years’ duration. A 6-year-old girl was brought to the dermatology clinic for the evaluation of a diffuse, pruritic eruption of 3 years’ duration. The lesions first appeared on the extremities and spread to the trunk, head, and neck. She had been seen 2 years earlier by a dermatologist who prescribed a topical corticosteroid for the condition. 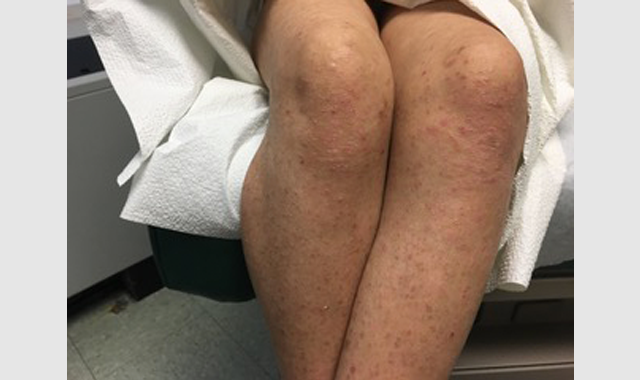 The patient’s mother could not remember the name of the corticosteroid, but she recalled that her daughter’s pruritus and lesions improved after treatment. When she was seen in the clinic for the current visit, she was not using any topical therapy. The patient was a student in the first grade and had no developmental or educational delays. Review of systems was negative for constitutional symptoms. The patient did not have any active or preceding illnesses or disorders. She was not taking any medications and had no known drug allergies. Family history was negative for similar cutaneous conditions or autoimmune disease. Multiple discrete, erythematous papules with centrally adherent scale and excoriations were scattered over the head, neck, trunk, upper and lower extremities, and dorsal hands and feet. Underlying and surrounding diffuse hypopigmented macules were present, some with fine scale (Figures 1-3). Figures 1 and 2. 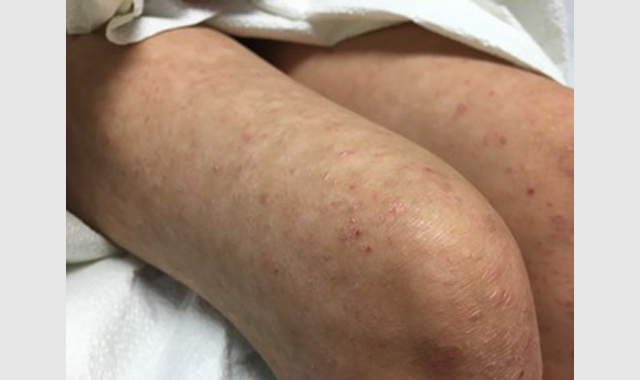 Multiple, discrete erythematous papules and diffuse hypopigmented macules affecting the lower extremities in a 6-year-old girl. Figure 3. Lesions affecting the back. Histologic examination revealed an acanthotic epidermis with a compact orthokeratotic stratum corneum. Mild to moderate transepidermal extravasation of erythrocytes was noted, as was a sparse vacuolar-interface lymphocytic infiltrate along the dermoepidermal junction (Figure 4). Figure 4. Histologic examination. Note mild to moderate transepidermal extravasation of erythrocytes and mild vacuolar interface dermatitis.